A proper road trip is priceless. The best result from a combination of stretched financial planning and catastrophic failures. In the desolate suburban landscape of Southern California, transportation of any sort is freedom. It is identity, it is self-reliance, it is escape. When everywhere within a 45-minute drive is a homogenous smear of strip malls, condominium complexes, and only slightly differing stucco, a means to leave is a cherished fruit. With years of practice spontaneously driving throughout the state of California, I am relishing the comfortable 80 mph coasting speed of a hand-me-down Volvo 240-GL on the way past Morro Bay. Jacob and Erik are gleefully engaged in their customary banter over which of them is more evil, and what behavior qualifies these dark depths. Jacob means it. True to form, Erik could care less, but intuitively panders to Jacob’s competitive nature just enough to keep the evocative lines on his forehead moving. They will wrestle later. It is inevitable, and is just as likely to happen in a grocery store isle as on the side of the road. Before we left San Diego, I moved what luggage we had to the passenger side of the back seat to make room for Jacob so he would have a clear view of the Big Sur coastline on our way back to Santa Cruz. It occurs to me that this seating arrangement is the only thing keeping Jacob from grappling Erik in an embrace like a honey badger in love. 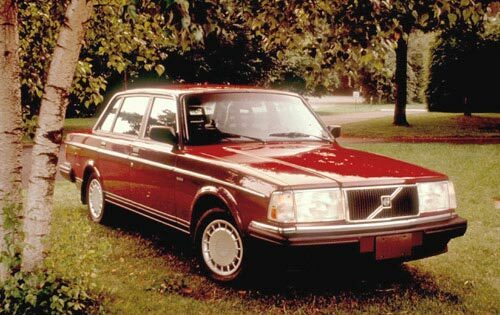 The Volvo 240-Gl is a tank. Nicknamed “The Brick” this lovely metallic burgundy block of steel is a favored car of the community college working class of Santa Cruz. The sheer weight of the thing maintains momentous coasting speeds. With the slightest downhill grade it will, for instance, roll almost 3 miles through downtown Cambria to the nearest gas station when the battery runs out of juice, if one is not preoccupied with stop signs and the like. After a long and grumbly discussion and $20 dollars, the grizzly mechanic at the Cambria Chevron finally agrees to put our battery on a trickle charger while we clamber into a nearby copse of coastal cypress trees for some self entitled beer and bickering. This trip, I am accompanied by an older mechanical camera from a yard sale. This is my first attempt to learn basic film photography. Erik’s tutelage is facilitating what turns out to be lovely black and white shots of Jacob’s majestic gaze accented by the Big Sur coast; definitely not the other way around. Jacob has all the presence of a Norse god in a compact package of self-confidence and loving humor. 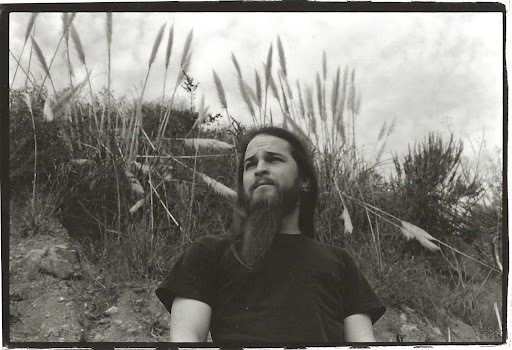 His expressive forehead creases, swaying beard, and sky sharp eyes effectively make him the focal point of any photo, even of the rolling Big Sur coastline. Tall ginger Erik is his polar opposite and subtly directs our attention back toward general mischief where it belongs. Long ago in a fit of idealism, I promised myself that I would never compromise on what I would do with my life, that I would never give up on my dreams, that I would never trap myself in a job or career just because it paid well. I steeled myself against turning out the way I saw my parents at the time. If I was going to spend the majority of my waking adult hours doing any one thing, I’d better love what I am doing. Relative poverty has taught me many things. Emergency vehicle maintenance is among those. The Brick needs an alternator and our battery has enough charge to get us to a crappy auto parts store in Morro Bay, so long as we make use of the downhill stretches of road and keep the momentum up. My last $100 later, I am under the car in the store parking lot with rudimentary tools gleefully spitting venom as if I am in San Diego rush hour traffic. Erik and Jacob waffle through their repertoire of poking each other, smoking cigarettes, and facetiously offering me help in order to stoke by bitching streak. None of us are mechanically inclined and we’ve spent hours experimentally learning to install the alternator. I finish with only a handful of parts that didn’t seem to have a place to go back to in the engine. It’ll have to do. In the warm night outside the yellow-orange glow of the parking lot lamps, it is dark. There is no way to manage the rest of the drive tonight. It is sacrilegious even for a stalwart atheist to drive through Big Sur without a view of the forested turquoise bays and kelp beds. It has been clear weather, and Jacob will get his postcard scenery if I have to incite Erik to duct tape him to the hood of The Brick. After all, I started this day with a plan. Jacob puts up his last bit of cash for a cheap motel, sheltering us in our short hibernation to which he succumbs the second he hits the pillow. His stern eyes turn cherubic as Erik and I watch Jacob’s torpor set in mid-sentence. He’s tuckered. My friend Mark likes to make fun of Erik and I for our unanimous poor behavior. He says that Erik will pretend to be responsible until I show up and put “spaaaarrrkles” on him, after which, we both take a wallop to our heads and someone has photographs that need explaining in the morning. I always think that it’s a little demeaning when friends say things that imply a lack of decision-making ability about each other. These are especially awful from male friends when they carry a juvenile sexist undertone with statements like; “…she’s just controlling your mind”. They give no credit to the person supposedly being mind-controlled while imbuing the women with evil voodoo-like abilities. Erik always has a choice in these things. We simply share a comfortable safety around each other that enables even simple times to be adventure. Fueled by the day’s frustrations, I quickly sparkle Erik and we make the reasonable decision to blow our last few dollars on a magnum of swill wine in order to drink ourselves stupid on the nearest beach. Neither of us knows the area well. After a short time of being lost on some one-way streets while looking for said beach, we finally land on a flat of mud with the shallow bay about 100 yards away. My spite over our thwarted plans has me positively worked into a froth. I lead the charge across to the damned relaxing scenery where we intend to park ourselves for drinking. Somewhere around my third or fourth plod, I come to a grinding halt after I see an unmistakable bright blue flash radiate from under my angry boot print. As with any time I see this, I simply refuse to believe the first glimpse. I take another stomping step, and there it is again. I yell for Erik. He is relieving himself in some shrubbery next to the road, and hurries to catch up to what he thinks is more hysterics from me about the day. 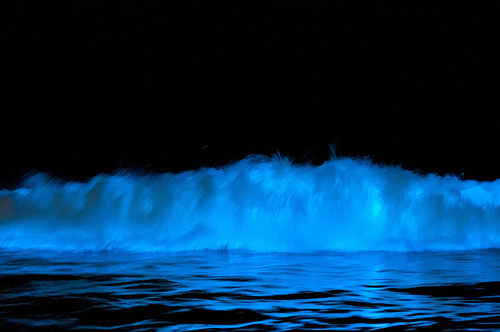 On occasional late nights in Encinitas California, I would catch a glimpse of blue-green glowing streaks along the beach while driving the freeway past coastal lagoons, half a mile inland. At first I would assume it was fatigued hallucinations from long caffeinated nights exploiting my motorcycle liberation. I would exit the freeway and make my way down to watch the tumultuous lightning crashing through the whitewash with each breaking nighttime wave. When conditions are just right in the ocean, tiny plant-like organisms called Dinoflagellates can reproduce with an exponential speed that changes the color of the water. Just as plants on land come in more colors than green, planktonic plants in the ocean appear in different colors as well when concentrations in the water are high enough to see them. They often appear red, yellow, or brown in the day and are ominously referred to as “red tide”. This misnomer implies that all reddish colored plankton are harmful. Toxins in them build up in the food web and harm animals through shellfish poisoning. The general term for the explosive growth of plant plankton is a “plankton bloom.” It turns out that many of the toxic harmful algal blooms appear green, and blooms of many of the red colored species are not harmful at all. There are a few different species occurring throughout California that appear red in daylight. 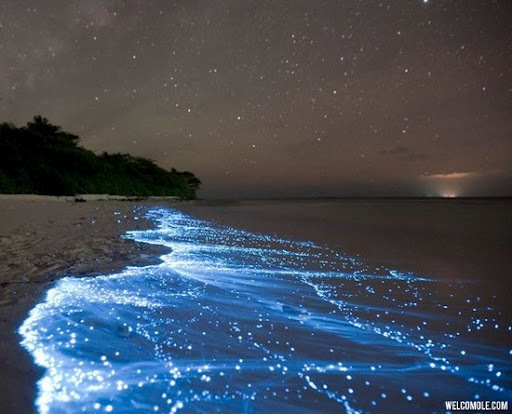 At night, they give off a tiny bioluminescent blue light. Through an enzymatic reaction, they produce this chemical light when the water they are in is agitated. The light reaction itself is remarkable in that it does not produce heat as a byproduct the way that combustive or electrical light reactions do. On these very special nights you can watch bright waves crashing or the passage of marine mammals underwater as they leave a powerful glow in their wake. I would just sit there, often alone and heavy-lidded with exhaustion, content to watch this marvel through the night. I would stay unreasonably late, afraid I may miss the best part if I left too soon, and knowing that this was as impossible as memorizing the details of any single sunset. I find a profound irony in people’s attempts to attach religious superstition to a world in which the scientific explanations for real and tangible phenomena are so much more fantastic. The intricate grace behind the scientific explanations of many of these wonders of the world makes them so much more precious than the ham-handed write-off of a deity’s will. Now I recognize the mud-sparkles for what they are and I am positively giddy. This is the result of rusty red water, the residue of “red tide” on the soil. 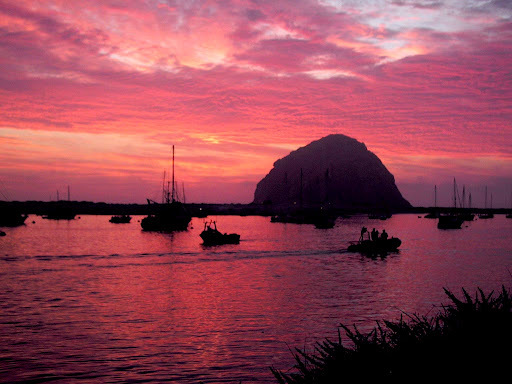 Morro Bay covers an area of roughly 4 square miles and connects to an estuary system. The larger watershed flushes silt through the bay making it shallow and results in wide expanses of seawater soaked mudflats at low tide. Every footfall causes enough disturbance in the soaked ground to flash an electric ephemeral blue radius, sometimes 2 feet wide, from under our shoes. Soon we leave our bottle of wine in a bush for later and continue to splash and jump about like impossibly thuggish little boys. The mild anxiety of committing each flashing step to memory sweeps through me. Erik giggles while we tell distracted stories through our jumping up and down. His excitement at these things is usually a little less than mine. He commits his attention anyway, either because this is such a rare experience, or because he knows my heart and wants to let me play this through. We carry on for a couple of hours, back and forth, leaving our little spit of bay looking rototilled in the faint moonlight. Our feet covered in salty black goo, we finally trod the rest of the way to the water’s edge and stand breathless from exertion, eyes cast toward the darkened volcanic plug silhouette of Morro Rock. We just stand there with our arms around each other’s shoulders winding down for long minutes before we decide to pack it in for the night. Erik collects our unopened bottle of wine and we return to curl up in our cramped motel nest with Jacob who is soundly sleeping in preparation for the mind-blowing views I have planned for him tomorrow. The details of each brilliant flash-step this night will, of course, fade from memory near as fast as from vision. I nod off in sleep hoping that the setbacks with these men tomorrow will live up to today’s sparkles. This entry was posted in central coast, Morro Bay and tagged Big Sur, bioluminescent, central coast, dinoflagellate, Morro Bay, Red tide, road trip, sparkles by Chris Reeves. Bookmark the permalink.